One of the cheeses I miss is haloumi, that dense, fried, salty, cheese hit eaten with lemon. I need to state up front that I am not a huge fan of nutritional yeast as a cheese substitute. I know people say that it tastes like cheese, but really, for me, it tastes like yeast that’s reminiscent of cheese. So I approached this recipe with some skepticism. No it isn’t exactly haloumi, but yes it is good. It is made from frozen tofu, that is thawed, pressed and marinated before frying. I found the recipe at Cooking with Plants. I’ve tweaked it a bit to use less nutritional yeast, but otherwise it is the same. The texture is reminiscent of haloumi, chewy and dense, but without the squeak (lovers of haloumi will know what I mean). 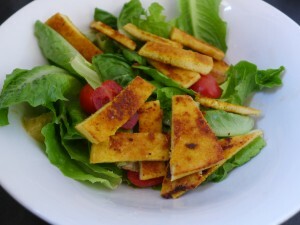 The flavour, though very yummy, is not exactly like haloumi, but it does pack a great salty, crispy, chewy punch which fits the bill nicely in a salad. I ate mine with a green salad with some fresh tomatoes from the garden. I also ate the remainder on sandwiches over the next few days. It makes a good burger, with its firm texture, so I think I’ll experiment with the thickness and some other flavourings as well next time. Freeze the tofu overnight then thaw it the next day. This freezing process changes the texture of the tofu, making it chewier. Slice the tofu into ½ cm slices. Mix all the other ingredients in a bowl except the oil and water. Add enough of the water to make a paste. Heat the oil in a non stick frying pan and fry the slices over medium heat for 2-3 minutes each side. They will crisp up. Sounds good! Looking forward to trying this one. One of the things I miss most about being vegan is cheese. The rest, I don’t really have any interest in anymore, but sometimes I see cheese and I miss it. Is haloumi what is used for saganaki? HI Melissa, yes it is one of the Greek cheeses that get fried.